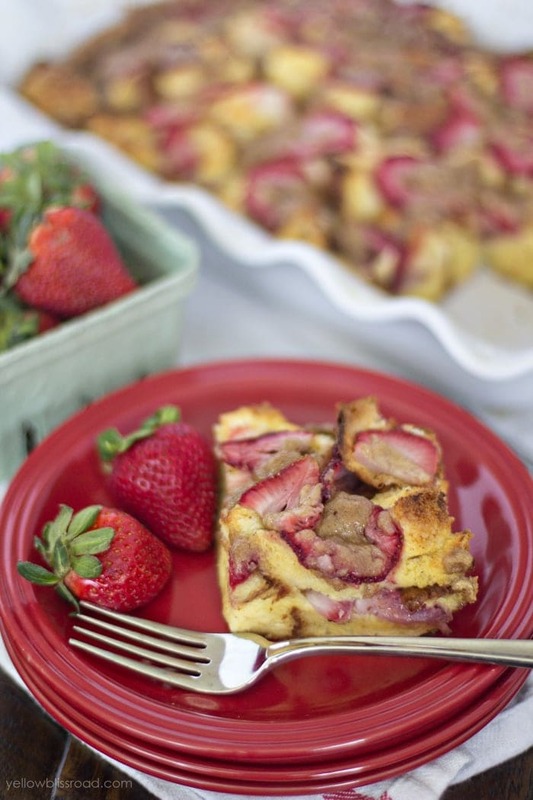 Ripe, juicy strawberries sandwiched between sweet Hawaiian bread and baked French Toast style. 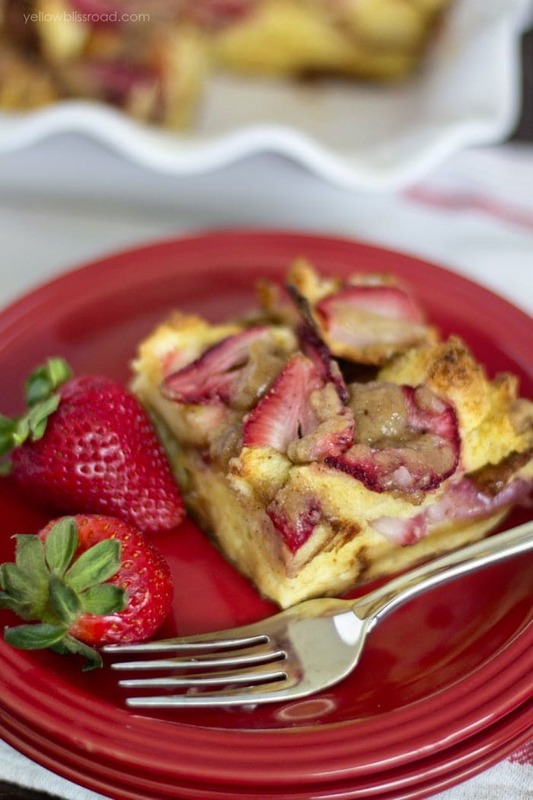 My Strawberry French Toast Bake is perfect for Sunday brunch or a lazy Saturday breakfast. I have become a little addicted to french toast bake recipes since making my Pumpkin Pie Baked French Toast last fall. Both of my kids love them too, so it’s not hard to get them to sit down and eat breakfast when I make this. 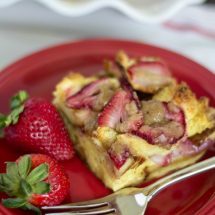 Since it’s strawberry season, I figured what better fruit to add to my favorite Baked French Toast recipe? It really couldn’t be easier to make. Just think of how you normally make french toast – eggs, milk, sugar, and bread, right? Toss in some strawberries and you’ve got this! I think most people typically will use french bread for french toast, but I prefer to use a loaf of King’s Hawaiian Bread. It’s got a nice sweetness and holds up to the egg mixture really well. The strawberries are best sliced thin and sandwiched between two layers of bread cubes, and then on top with a butter and brown sugar crumble. I like to use my egg slicer to get nice even cuts for my strawberries. PRO TIP – an egg slicer isn’t just for eggs! Use it to chop strawberries, mushrooms, bananas, and even soft cheese!). HOW LONG DO YOU BAKE A FRENCH TOAST CASSEROLE? Ideally, you would wrap it up and chill it overnight in the fridge so it’s ready to bake the next morning. However, I’ve found that to be unnecessary. 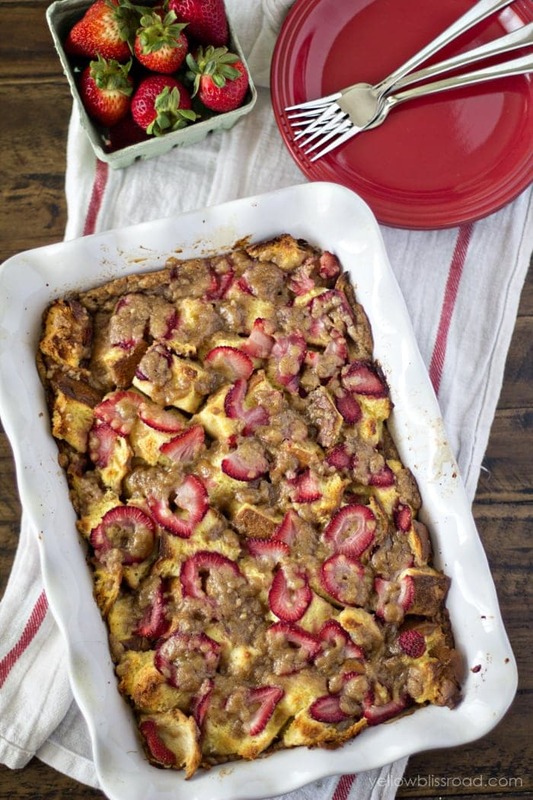 You can bake this French Toast Bake right away, or refrigerate overnight to make in the morning. Either way, it will take 45 minutes to an hour to bake. Yes, as long as you store it properly. When the casserole is cooled, remove from the pan (preferably within 2 hours of baking). Wrap tightly with foil or plastic wrap and store in a freezer bag. To reheat, place the baked french toast in a casserole dish or on a baking sheet and bake at 350 degrees for 10 minutes or until hot. Preheat oven to 350 degrees. Use butter (or cooking spray) to lightly grease an 9"x13" baking dish. In a medium sized bowl, whisk together eggs, milk, sugars, cinnamon and vanilla. Layer half of the torn bread pieces on the bottom of the baking dish, and layer 1 cup of the strawberries over the bread. Layer the remaining bread, and then the remaining strawberries. Pour egg mixture evenly over bread and strawberries. In a small bowl, combine flour, brown sugar and cinnamon. Cut in butter with a pastry cutter or your fingers to combine until it resembles coarse crumbs. Sprinkle over the bread mixture. Bake at 350 degrees for about 50 minutes. Allow to cool and set for 10 minutes. Serve warm. You can make this recipe ahead of time, and refrigerate overnight until ready to bake, but you may need to add an additional 10 minutes or so to the baking time. If you mix the cinnamon with the white sugar before adding it to the eggs, it doesn’t clump into cinnamon bombs. Today I’m making one with mango/pineapple, one with berry/cherry. This is fantastic! Making with peaches next time! Can I make this up the night before and bake it in the morning? I plan to bring this into work and it would be easier for me to make it the evening before. Thanks!